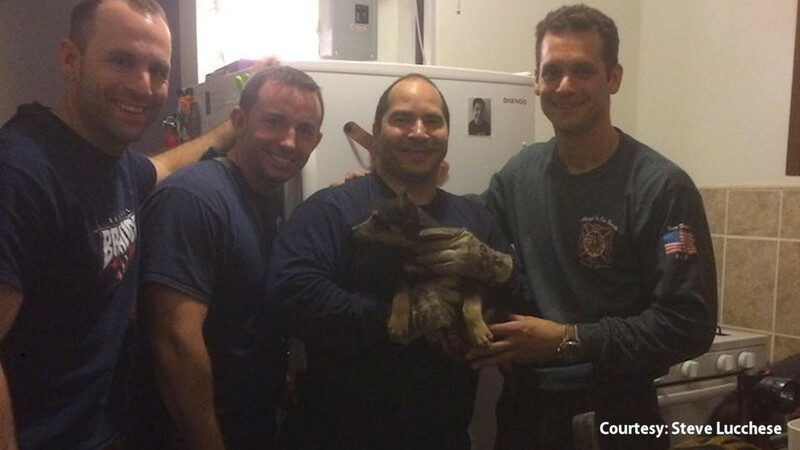 BRONX (WABC) -- The FDNY made an amazing rescue of a puppy in the Bronx who is deaf and blind. A family's dog went missing for a few days and no matter how hard they looked, the family couldn't find the puppy. "Then today (Friday) they heard him whimpering in the wall," said FDNY Lieutenant Steven Lucchese, Engine 83. Lt. Lucchese along with Firefighters Patrick Chatterton, Brian Murphy, Anthony Morales, and Kyle Nevin responded to the call of a puppy trapped inside a wall. "The homeowner was renovating the bathroom, and there was a hole where the bathtub used to be," Lucchese said. The firefighters discovered after looking through the hole, that the puppy had fallen seven feet and was caught between the sheet rock and a pipe. They managed to break open a part of the floor and pulled the puppy out. "The little boy and his mom were incredibly grateful. It felt good, and we're so glad the little guy is okay," Lucchese said. The puppy, named Mustafa, is now safe and sound with his family.